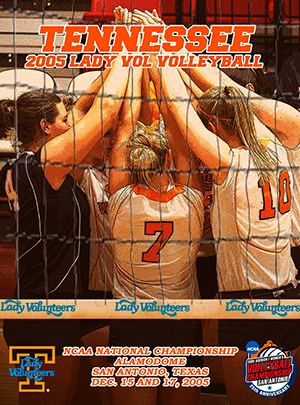 Today, December 15th, marks the tenth anniversary of what has to be one of the biggest moments in Tennessee volleyball history. 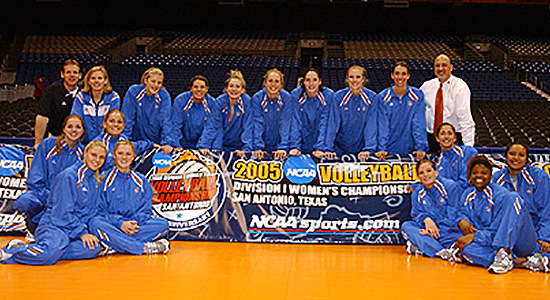 In 2005, a group of Lady Vols built on what they had started the previous year, overcame adversity early and late in the season, and ended up among the elite of college volleyball with a berth in the NCAA Final Four. Head coach Rob Patrick had been steadily building up the program since taking on the job. After being hired the summer before the season started in 1997, his first team went 15-19. But things were all uphill after that. In 2003, the Lady Vols had an impressive 22-9 record — just the second season with single-digit losses in school history and the first since 1982. It was also the team’s third 20 win season in four years. Despite their record, a school high 10 conference wins, a 11-2 out-of-conference record, including victories over the ACC and Big South Conference champions, the Lady Vols weren’t invited to the NCAA Tournament. With a chip on their shoulders and something to prove, the 2004 set high expectations for themselves — expectations they met and exceeded. The team went 32-3, defeated six ranked teams, earned their first spot in the polls in 19 years, defeated Florida twice in one week in Gainesville, shared the regular season league title with a 15-1 record, won the SEC Tournament, made it to the NCAA Sweet Sixteen where they barely lost in the fifth set 15-12, and finished the year ranked in the top ten. While expectations were high the previous year, the success of that season ratcheted things up in 2005. If the team’s downfall in 2004 was partly due to lack of tournament experience, they had it now. With nine letter winners, including six of the seven starters returning, along with five freshman and a transfer from Nebraska, anticipation was growing. Every season the press was told “winning the SEC and going deep in the NCAA tournament” was the team’s mission. But with that accomplished the year prior, two other words were added would made their usual goal that much more challenging: Final Four. A big difference between expectations in 2004 and 2005 was that this time those outside the program were taking notice. Four conference coaches picked the Lady Vols to top Florida for the title (from 1998 to this day that’s the third most any team other than Florida has ever received). And nationally Tennessee was ranked #9, matching the school’s highest ever ranking set the season before, and besting their highest preseason ranking of #14 set in 1983. What no one could have known at the time was that while Tennessee would once again exceed expectations, the route they would take to get there would look very different from 2004. The season started off with a sweep of Lipscomb, then moved to Missouri where the Lady Vols swept Utah before facing the homestanding #21 Tigers in an early season test. Something happened in that match that the team hadn’t seen in 21 months — they lost a match 3-0. Coach Patrick marveled “the level that Missouri played both offensively and defensively was one of the highest that Tennessee has played since I’ve been coaching here”. Now #16, the team headed back to Knoxville for the first time where they easily swept through all three matches of their home tournament without losing a set. Outside hitter Yulia Stoyanova had a big weekend for the orange and white, averaging 5.78 kills per set and hitting .450. The sophomore was named the National Player of the Week for her efforts. The Lady Vols hit the road again for a tournament at Purdue. The first match went their way with a 3-1 win over Xavier. However, over the next two days they lost to Ohio and the Boilermakers, swept by both unranked teams. Tennessee at 6-3, fell out of the polls. 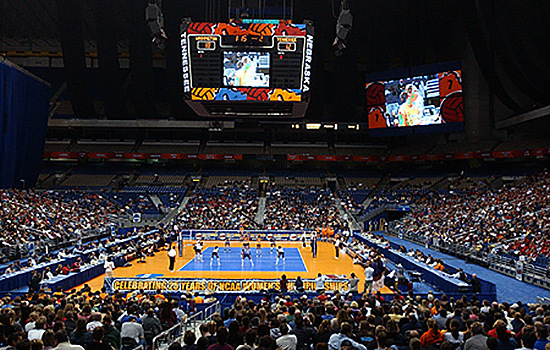 SEC play began in Arkansas where, due to Hurricane Katrina, they would face both the Razorbacks and LSU. Tennessee notched a 3-0 win vs Arkansas, but once again lost a match in three when playing the Tigers. A chance for redemption came a few days later when the team headed to Louisville. A win over the sixth ranked Cardinals would be the highest ranked team ever defeated by UT. But while they were able to avoid another sweep, they fell just short of victory falling 15-13 in the fifth set. Senior libero Amy Morris tied the school record with 36 digs in the match. After a couple of three-match wins vs the SEC’s Mississippi schools, the Lady Vols were set to take on #5 Florida. In 2004, UT had snapped the Gators’ 145 SEC regular season match winning streak, their 121 overall conference match winning streak, and their 109 straight SEC home match winning streak. After doing all that, they beat them on their home court again a week later. In 2005, Florida was aching for some payback. And they got it, in a 3-0 win over the Lady Vols. What must have been going through the minds of the players and coaches at this point? Unranked, a 9-6 record, halfway through the season and already twice the losses of the entire previous season, five of their six losses by sweep, three of those sweep losses to unranked teams, and not a single win vs a ranked opponent. If anyone was still thinking as far ahead as the Final Four they would probably have been labeled foolishly optimistic. In any case, with twelve regular season matches and the SEC Tournament remaining there was plenty of season left to salvage without dreaming of the postseason. Tennessee next headed to Georgia where they picked up a sweep over the Bulldogs. Then to Auburn where Julie Knytych broke the school record for career assists, previously held by (now UT assistant coach) Erica Lear, in a 3-1 victory. The Lady Vols had a setback at Alabama, losing 3-1. Now at 11-7 overall and 5-3 in the SEC, the team had played 13 of its first 18 matches on the road, including six of their first eight league matches. 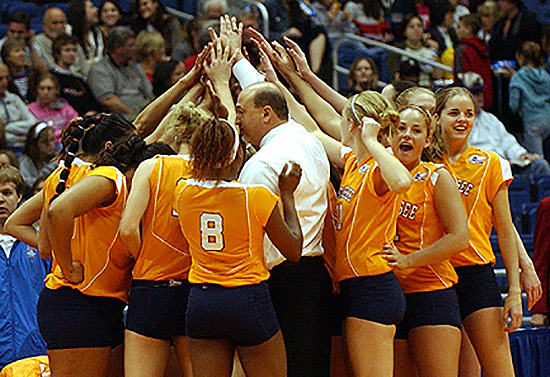 To end the season UT would play six of their final eight conference matches at home, where they had only lost a single match since 2004 and were undefeated in 2005. Kentucky travelled to Knoxville, where they were dealt a 3-0 loss. UT was led by Kristen Andre’s .680 hitting percentage — 17 kills on 25 attacks with no errors. In Columbia the team earned a 3-1 win over the Gamecocks. The next match vs Georgia was played in Tennessee’s current home, Thompson-Boling Arena, as part of the basketball team’s Big Orange Madness. In just the second match played in that facility the team set a still standing school attendance record with 3,311 people. It was the third-largest crowd to see the Lady Vols play, home or away, at the time, and the largest crowd to see any non-basketball Lady Vols sporting event. Tennessee swept the Bulldogs. Next up was Florida, now up to #4 in the polls. The Gators were on an impressive 203 match winning streak against unranked opponents, and a 78 match SEC road winning streak. UF came into the match on a 14 match winning streak and a 21-1 record on the season. And they had won 13 straight in Knoxville. On top of that, Tennessee had never defeated a top five opponent in the previous 23 attempts all-time. After what had to be considered a disappointing season compared to the preseason hype, the Lady Vols really needed a signature win like this to hopefully get the season back on track. And unlike earlier in the season this time they pulled it off, winning the match 15-12 in the fifth set. The Lady Vols almost won in four. They had five match points but UF fought them off extending the set before ultimately holding off Tennessee 39-37 — still the highest scoring set in school history. A 33 kill performance by Kristen Andre was the tenth best in school history and has only been topped once since then. A Florida player got the first triple double ever earned by a Gator despite the loss. After losing 28 straight vs Florida, UT had now won three of their last four meetings, picked up their first top five opponent victory, and gotten some much needed confidence to finish strong. And finish strong they did. Tennessee swept every remaining conference match of the regular season, vs Kentucky, South Carolina, Alabama, and Auburn. Those final two games features some amazing hitting performances — seven different players hit over .450. Against Alabama Kristen Andre hit .800, Sarah Blum and Amy Morris .500, and Mindy Flynn .467. Versus Auburn Heather Harrington hit .733, Kelsey Fautsch .560, Milan Clarke .500, and Andre .444. After starting the season 9-6, the Lady Vols finished 10-1 giving them a 19-7 overall record and a 13-3 conference mark. The team jumped back into the rankings at #25. They had won eight straight matches, swept the last four, and won 13 sets in a row. After a somewhat disappointing start, the Lady Vols had come together to right the ship and were looking forward to carrying their momentum forward to reach their goals. The team earned the #2 seed going into the SEC Tournament. With Florida the #1 seed, that meant the two top teams in the league could once again face off in the finals. After 27 years, this would be the last SEC Tournament. Tennessee had made 26 appearances in the conference postseason, more than any other team (but tied with LSU). The Lady Vols could really cap off their late season comeback with a conference title and send off the tournament with a big orange bang. 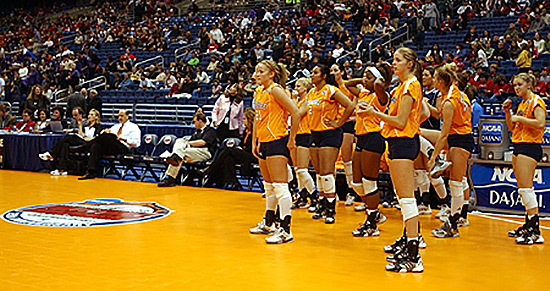 In the first match, UT swept #7 seed Mississippi State. The win extended the team’s win streak to nine, their sweep streak to five, and gave them their fourth straight 20 win season, making the senior class the first to earn that distinction since the 1981-84 squads. Alabama was next in the bracket. A win over the #6 seed tournament hosts would set up a finals between the two ranked SEC rivals. But first they had to get past the Tide. Alabama won the first set, but UT took the second and third. The fourth set started badly for the Lady Vols but they fought back to take the lead 26-24 late in the set. Both teams tied things up at 29 but Alabama was able to win the net two points and force a fifth set. Tennessee came out strong winning four of the first five points, until the Crimson Tide roared back to take a 6-4 lead — a lead they wouldn’t relinquish. Despite keeping it close, the Lady Vols were knocked out of the tournament with a 15-13 loss in the fifth. The defeat also dropped them back out of the poll. While they were able to dust off their early disappointments and make a run to reclaim their season, the failure to reach one of their top goals of an SEC title had to be a blow. But the team had already shown resiliency in the face of adversity this year and had come out stronger. If they were to reach their next goal they would have to do so again, and in short order. A potential spot in the NCAA Tournament was two weeks away, but before that they had one final test. Notre Dame was having their best season in over a decade. They had shared the Big East Conference regular season championship and then followed it up with the league tournament title. They were ranked #7 in the nation with a 28-2 record. They had given Florida their only loss of the year before Tennessee gave them their second. The first meeting between the schools would take place over Thanksgiving weekend in South Bend. The Fighting Irish came out firing on all cylinders earning 30-26 wins in both the first and second sets. Whatever coach Patrick said during the match break worked. The teams fought to a 28-28 tie in the third but UT fought off the Irish to keep the match going. The fourth set was another back and fourth affair that went down to the wire. Tennessee had to fight off two match points before picking up a 32-30 win. The Lady Vols were able to control the fifth set throughout, winning 15-9 and finishing the regular season by notching another top ten win. The match marked the first time in nine years the team had ever recovered from an 0-2 start to win. It was the first time they had done so under Patrick, and the first time ever versus a ranked opponent. Senior libero Amy Morris set a new school record for digs with 42, a number that still stands today. The season had been a topsy-turvy one for Tennessee, full of ups and downs and highs and lows. After a 9-6 start they now stood at 21-8. After losing to three straight ranked teams they had now defeated the #4 and #7 teams in the country. After suffering a loss almost every week for a month they had now won ten off their last eleven. And after skipping in and out of the polls they ended the regular season at #23. Tennessee’s late season run earned them, not only a berth in the NCAA Tournament and first/second round hosting, but also the 15th seed. The Lady Vols started the tournament against Jacksonville State. Making their first ever tourney appearance, the Gamecocks were the OVC tournament champs, had won 10 matches in a row, and had a 19-10 record. Tennessee got a 3-0 win to advance to the second round where they would face Minnesota. The Gophers were 25-7, ranked 17th in the country, had made the Sweet Sixteen in five of the last six years, the Final Four the last two years, and lost in the National Championship game in 2004. Tennessee started on fire and took the first set 30-19. But the experienced Minnesota squad stayed calm and won the next two sets 30-24 and 30-20. The Gophers had an intimidating late lead of 23-17 and then 25-20 in the fourth. With the season on the line the Lady Vols mounted a furious 8-1 run to take the lead and eventually the set 30-27. As they did against Notre Dame, Tennessee dominated the fifth ending Minnesota’s season 15-11. Senior libero Amy Morris set the school record for digs in a season and the Lady Vols ended their home schedule 13-0. For the second year in a row Tennessee was headed for the Sweet Sixteen. Last year just getting there had been the culmination of an incredible season. This year getting here had been expected — the goal was not here. In the way of their goal was #2 Penn State. The Nittany Lions were 31-2 and had gone an undefeated 20-0 in the Big Ten. They were on a 25 match winning streak. They had won 20 matches or more the last 29 years in a row. As formidable as Penn State was in the regular season, their postseason record was just as impressive. PSU had been in every NCAA Tournament since its inception in 1981. They’d made five Final Fours, played in the National Championship match four times, and won it all in 1999. At home, the Nittany Lions were 30-2 in tournament play. Penn State struck first winning five of the first six points in the match, but Tennessee caught up and the teams spent the rest of the set trading points before the Lady Vols got the 30-27 win. The Nittany Lions didn’t like that, and used that emotion to jump out to a 20-6 lead in the second set, eventually winning it 30-14. The third set was another see-saw game with no team leading by more than three until late, with UT getting a 30-27 win. The fourth set was the same as the third with no team getting a substantial lead until Penn State went up 26-22. The teams again tied things us at 28. PSU fought off a match point, then the Lady Vols staved off a set point on their way to winning the set and match 33-31. The Lady Vols had now done what no other team before them had done: advanced past the Sweet Sixteen. And while the goal was now in sight, they weren’t there yet. Next up was #8 Missouri — the team that had swept an excited #9 UT squad at the beginning of the season. The tables were turned a bit this time as the Tigers were now ranked in the top ten and the Lady Vols were ranked much lower (now up to #17). Mizzou was 25-4 on the year, with an impressive record over ranked opponents. They’d defeated six ranked teams, including four top ten opponents. Four of their ranked wins were sweeps, including three of the top ten teams. Two of their four losses had been to the #1 team in the country, one of which was a five-set match. After defeating UT earlier in the year and having the season they had had against the competition they had faced since then, you could count on them not being intimated by Tennessee in the rematch. But the Lady Vols weren’t the same team the Tigers had faced in September. The Lady Vols shot out to an early lead, but Missouri scratched its way back to take the lead. The teams went back and fourth before Tennessee just put away the set 30-28. Missouri had the advantage midway through the second set leading 13-8, but some Tennessee runs gave them a 26-25 lead down the stretch, and eventually the set 30-27. The teams traded points in the third until Mizzou pulled away halfway through the set and never looked back, winning 30-17. With the score 2-1, the Lady Vols were one set away from what at one point in the season seemed like an impossible goal. And in the fourth set they played like they knew it — starting the match with a 14-4 lead, never ahead by less than seven, and winning the set 30-17. Kristen Andre had a .576 hitting percentage without a single error on 33 attacks. Tennessee was headed to the Final Four. While making the Final Four may been a dream come true, it was also going to be a lot of work. They were to face #3 Washington for a chance to play for the National Championship. 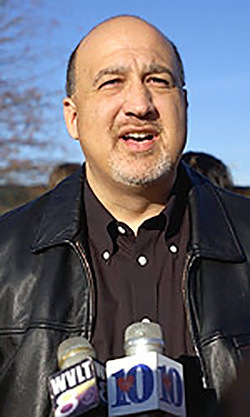 The Huskies were in the Final Four for the second season in a row. They were an impressive 30-1, and the champions of the Pac-10. UW had played an amazing 14 matches vs ranked opponents, losing only once. A mind-boggling 26 of their 30 wins were sweeps — including every win they had in the tournament so far. And unfortunately for Tennessee, they were the next team to face the Husky steamroller. The Lady Vols put up a valiant effort in the first before falling 30-25. But Washington was just too much, taking the second set 30-19 and the third 30-21. UW would go on to win the national championship over Nebraska — sweeping every team they played in the tournament. Tennessee won 14 of their last 16 games. They defeated six ranked teams, including four in the top ten. After never defeating a top five opponent, the Lady Vols had beat two in one season. Kristen Andre was named the program’s second First Team All-American. Amy Morris earned Third Team All-American. Julie Knytych and Yuliya Stoyanova picked up All-American honorable mention honors. Rob Patrick was named the Volleyball Magazine Coach of the Year. Tennessee was just the fifth school in the Eastern Time Zone to ever reach the Final Four. The senior class was the winningest in UT history with a 97-32 (.752) record. And when the final poll was released, Tennessee had secured its highest ever ranking as the #6 team in the nation. After losing in the Sweet Sixteen the year before and in all the lead up to the 2005 season, when the players and coaches dreamed about the possibilities of this season, this probably isn’t exactly how they pictured it happening! 2004 had been such an impressive run with very little going wrong. 2005 had been filled with problems, losses, and moments where it seemed they would never even get a chance to achieve their goals. But the hardships may have been what made this team stronger. And the adversity is what made the end results even sweeter than if it had just been handed to them on a silver platter. The 2005 season was a milestone in Tennessee history. Like the 2005 season itself, the ten years since then have seen their share of highs and lows. But there is no question the legacy these players left in place put the team on an upwards trajectory. In the years since UT has: won an SEC Championship, had six 20+ win seasons, had five seasons with 10 or fewer losses, appeared in six NCAA Tournaments, finished in the polls four times, had 11 players earn 15 All-America honors, won seven SEC postseason awards, had their recruiting classes ranked among the top in the nation every year. Proving that Tennessee deserved to be among the top teams in the country, which in turn made potential new Lady Vols take notice, may be the real legacy those players and coaches gifted Tennessee volleyball. All photos are from UT Sports.